We did it! I know you probably wondered when this day would arrive! I have been saying about our kitchen renovation for months now, and please be assured I haven’t just been lazy and not updated you! It really has taken us this long to get it all completed. Life has got in the way recently and delayed jobs getting done, you can read about part 1 and part 2 on my blog if you need a quick update. So now for the grand reveal, I like to remind people what it was like before, so you can see what we’ve done. When we moved in 3.5 years ago…….. 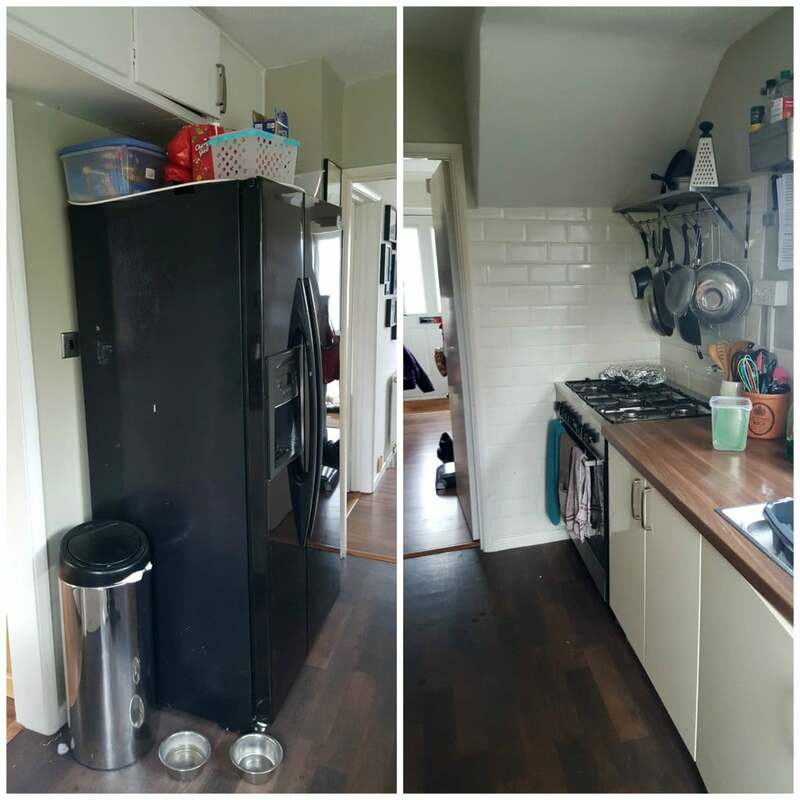 When we moved in we had to have some worktop space and more cupboards, we are a family of 5 and this was not a kitchen to prepare dinner for 5! 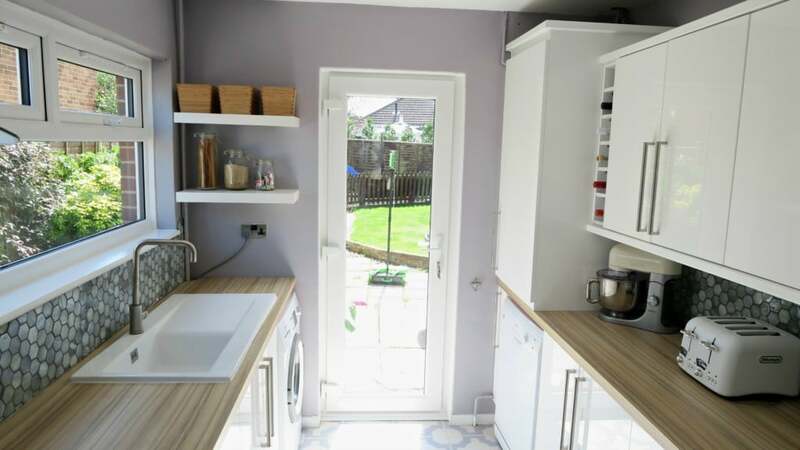 So we added in some units and worktops but didn’t change the layout or anything major. Worked with the space we had and did it as cheap as possible. 3 years later, it was dark, small and still not enough worktop space, see that piece of worktop next to the cooker. We prepared, cooked and served our dinners on that for 3 years. What a difference! 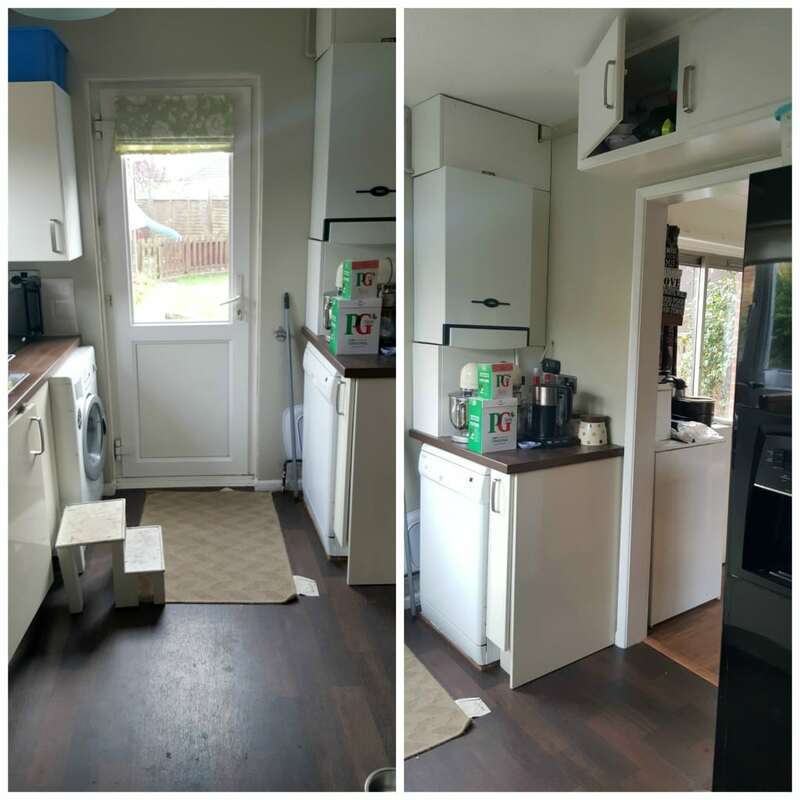 We are over the moon with it, it is so much lighter, brighter, colourful, clean, neat, worktop space and cupboard space. I will list everything at the bottom of this blog post, and where we got it from. I also have created a kitchen tour video, which shows everything. 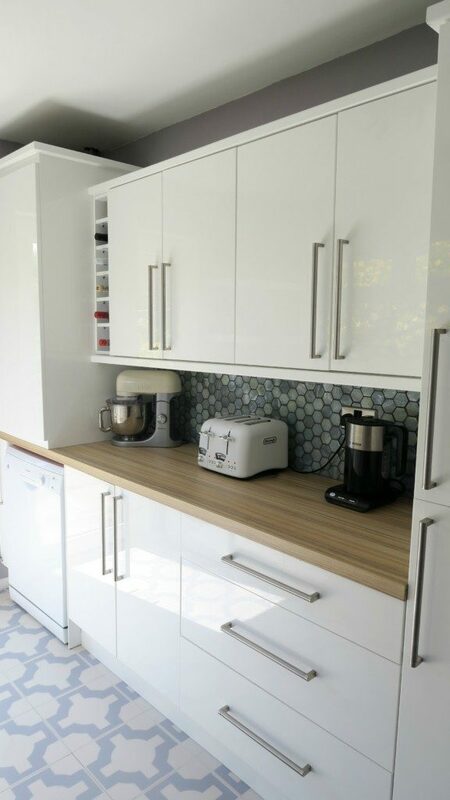 The main kitchen units are gloss white, with brushed chrome handles and standard height wall units. 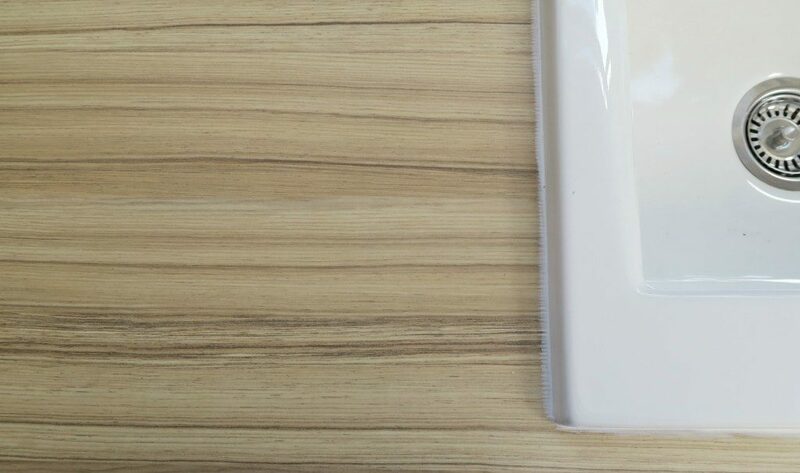 With a wood effect worktop, in a very light wood. It has grove to it and texture, rather than a smooth flat texture. This makes it look a bit unusual, and I am really pleased with it. I was considering a white worktop but to get a decent one you needed to spend quite a bit, so this worktop wasn’t what I wanted at the time. However I had got so frustrated with it, I just wanted a worktop! Although now it is in, I am really pleased with it and I like it. 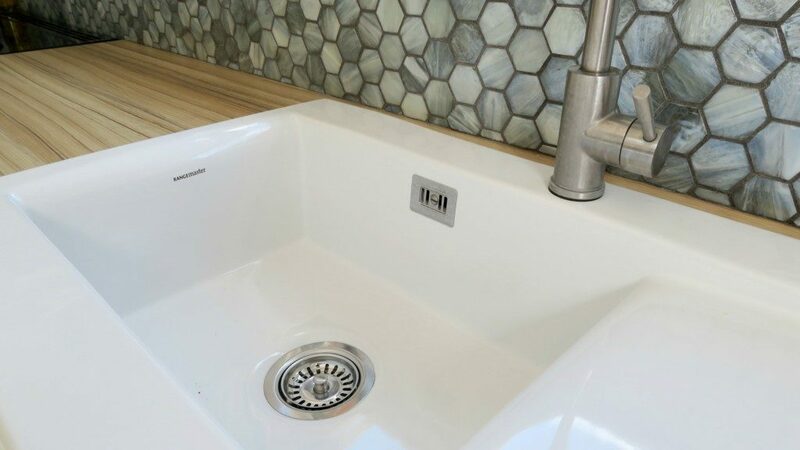 Sink was from Rangemaster, I wanted a white ceramic sink and when I saw this design I knew it was perfect. Straight lines, smooth drainer and really good quality. Although don’t get one if you are a bit rough and tough with your washing up. Anything metal marks the sink if knocked against it, I knocked the slow cooker against it and caused a slight damage to it. I had a metal drainer on it, the rust from the feet stained the drainer….grrr! Little things please little minds they say……well yes they do! 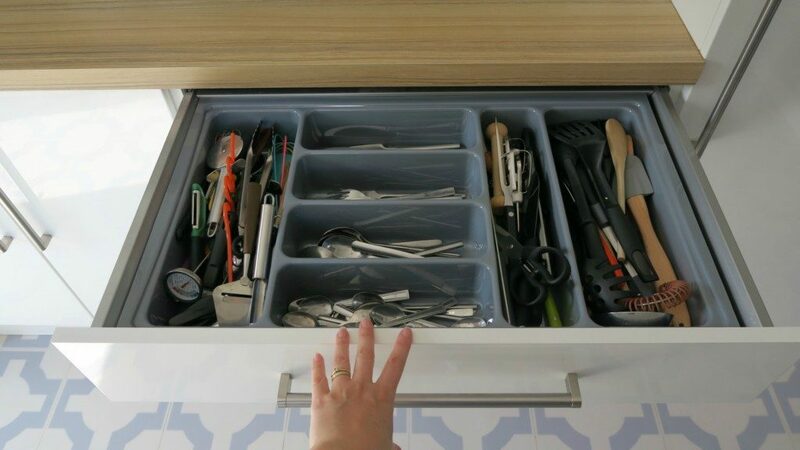 I am so excited by my 800mm drawer unit, I didn’t even have a set of drawers in the old kitchen. I had to go out into the next room to get any cutlery, plates and bowls. Please excuse my messy pan drawer, it does need sorting but I have all my pans in one drawer and I’m spoilt! Also if you notice, I now have my plates in one drawer. I really like this because when we had our plates in a cupboard we had to pile things in front of them, never easy to get out and the kids would struggle. Now they are easy to get to, kids can easily get them and so easy to pick up. 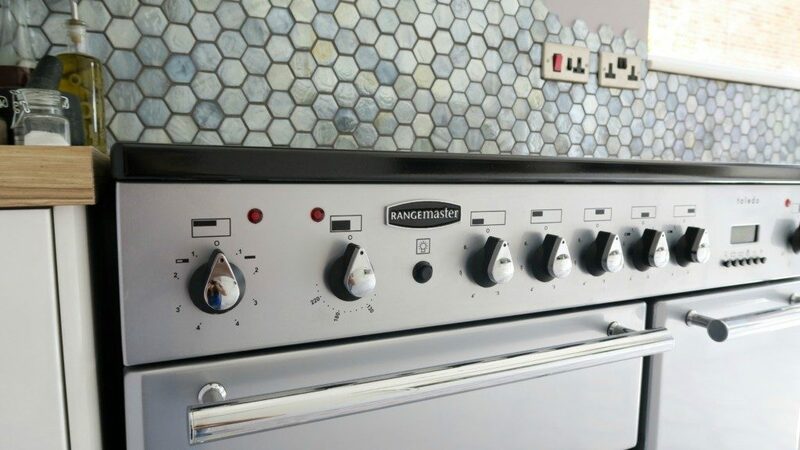 We also got a new cooker, the old one was on its last legs and I have always wanted a Rangemaster range. So I worked really hard on my blog, and thanks to you guys I purchased one myself! I was so nervous buying it, as it nearly cost as much as the kitchen units did and we never spend money like that! However it is perfect, I searched around for the best price and AO.com came up trumps. 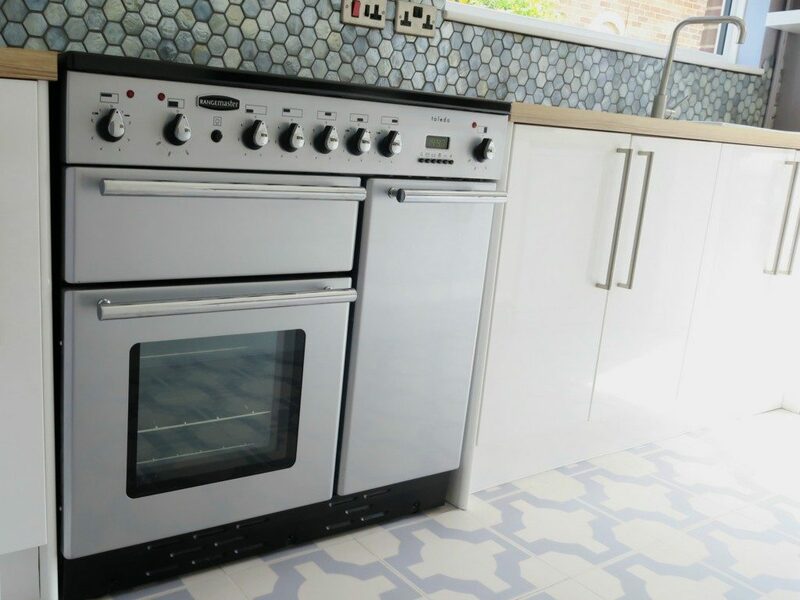 The delivery time for my colour choice was a few weeks but this gave us time to get the kitchen to a good enough state to have it installed. 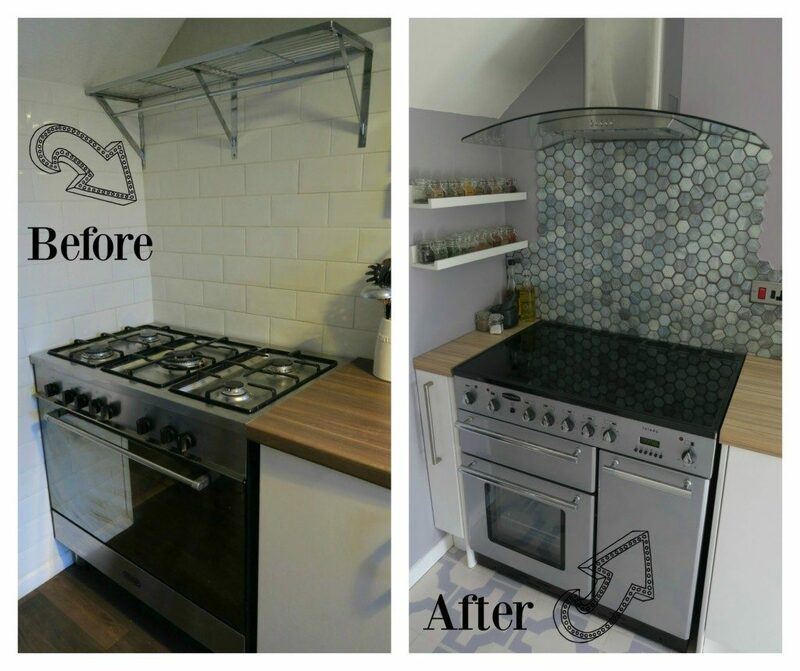 The extractor fan is mainly glass, I wanted a glass one so that it didn’t impact on the room too much and stand out. Although hubby keeps banging his head on it! It was cheap, so it is quite noisy but it does the job ok! 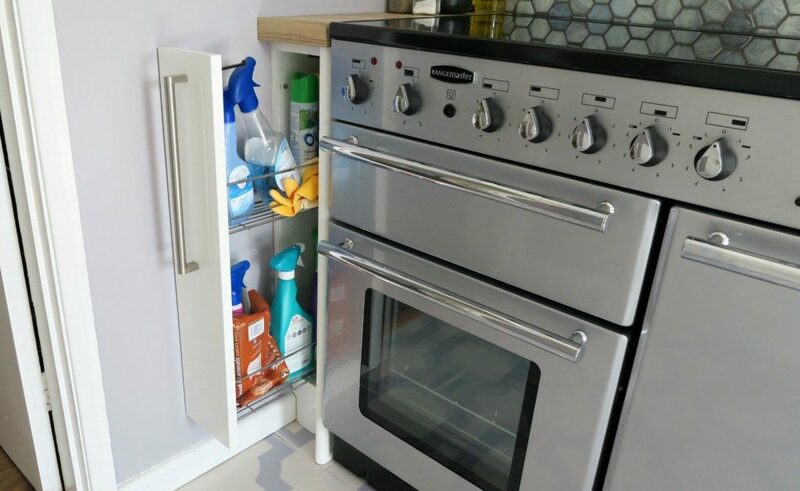 We had a little gap to the left of the cooker, so installed a little pull out unit for all my cleaning products. I can place a child lock on it and push them all away. It does pull further out than this photo. As I didn’t have one of those drawers where you can chuck all those kitchen bits and bobs in, I needed some sort of storage for that. So we fitted some Ikea floating shelves on the end wall, and spotted these little wooden boxes to fill up. No one can see what rubbish is in them! 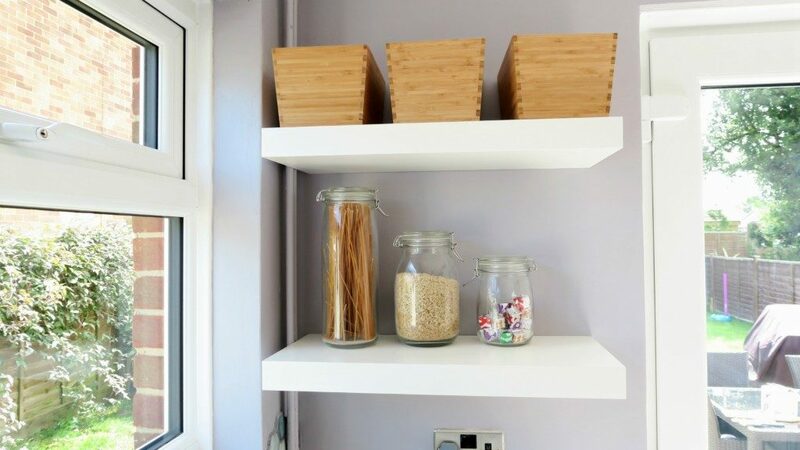 Also I can use the shelf below for my glass jars of pasta and rice, I quite like being able to see them out on display. Also next to my cooker I have put in some spice racks, however they aren’t you standard spice racks! These shelves are from Ikea and are usually used for placing picture frames on, or used as a book shelf. 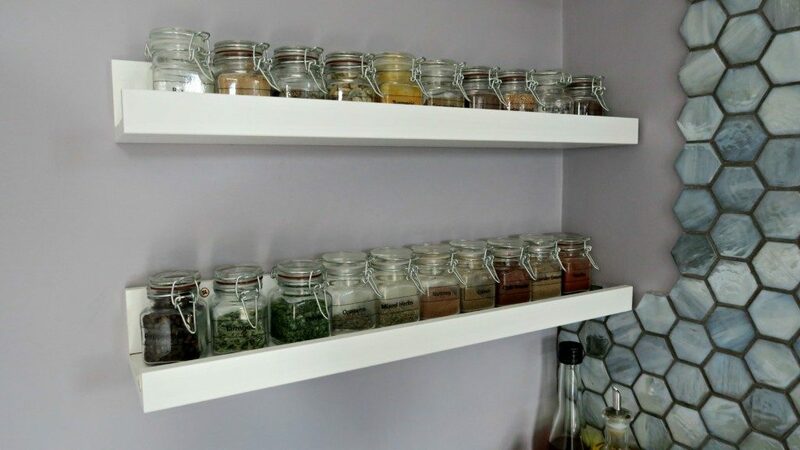 I purchased the little jars and name stickers and got rid of all those colourful spice jars. We also had a large boiler in the kitchen, so this needed covering over. 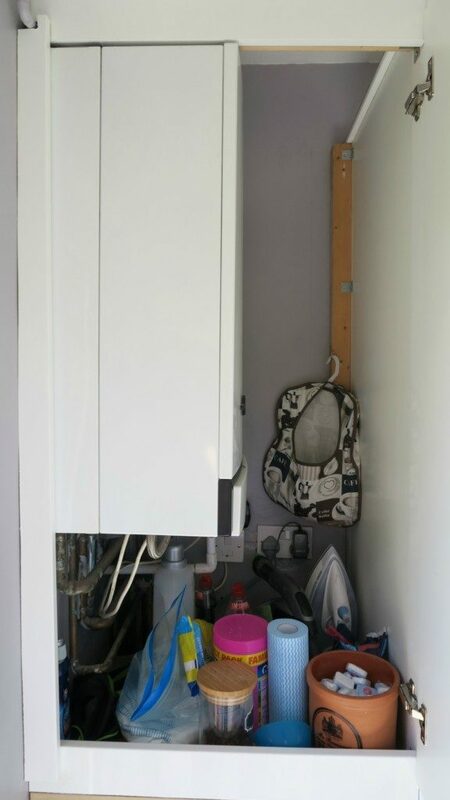 Hubby was really clever and managed to box it in using panels from the Santini range, and now I can use it for storing all the cleaning bits, garden stuff and washing power. I think I will sort this out properly at some point, using boxes and better storage ideas. I wanted a grey toned paint on the walls but was unsure on what colour to go for, once I chose the flooring it gave me an idea. 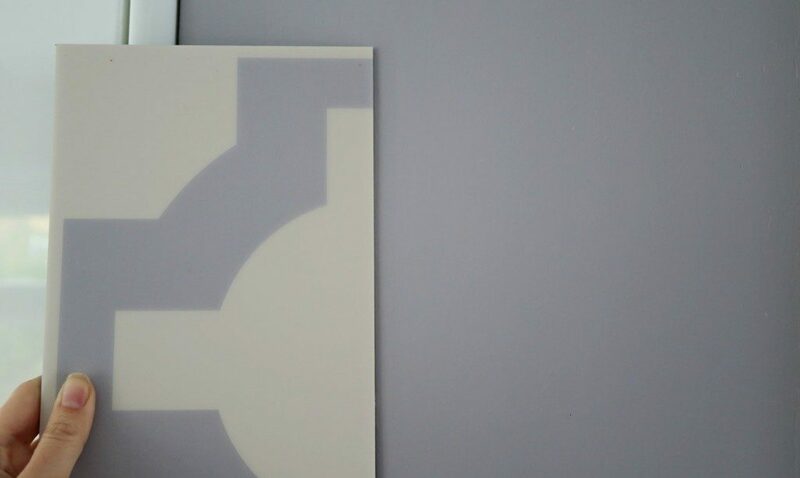 I took my tile along to the colour matching service at B&Q to see if we could find a paint that matched the grey on the tile. They matched it perfect, and I really like this colour grey. It has a slight purple colour tone to it, which makes it a warm grey, it’s worked really well. We used Valspar Kitchen & Bathroom paint which has a slight sheen to it, but was easy to apply and any splashes wipe off really easy. 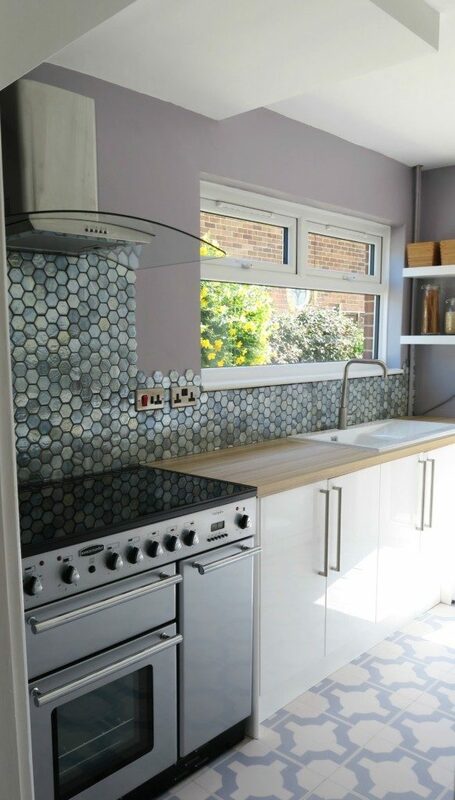 As you would have noticed, my wonderful tiles, I wanted something that was really different. Gave me a splash of colour and a wow impact…I think I achieved that! Please have a look at the full review blog post on them to find out more about them. Also you would have spotted the flooring, different? Wow? Love it? What do you think? I love it! Have a look at my full review of the Harvey Maria flooring, the quality is amazing and I really love that it has turned the room into something so unusual and with a splash of colour. I hope you like the change as much as we do! Here is a list of the items included in our kitchen and where we have purchased them, items marked with a * are review items and you can find out more information on them in their full blog posts. *Some items have been offered to me for review, they are marked with a *. However all words are honest and of my own. Post does contain affiliate links. Thank you, the floor are so cute aren’t they. I wanted something a bit different and I think I got that! Amazing transformation! I particularly loved the little pull out unit for the cleaning materials and the new flooring! 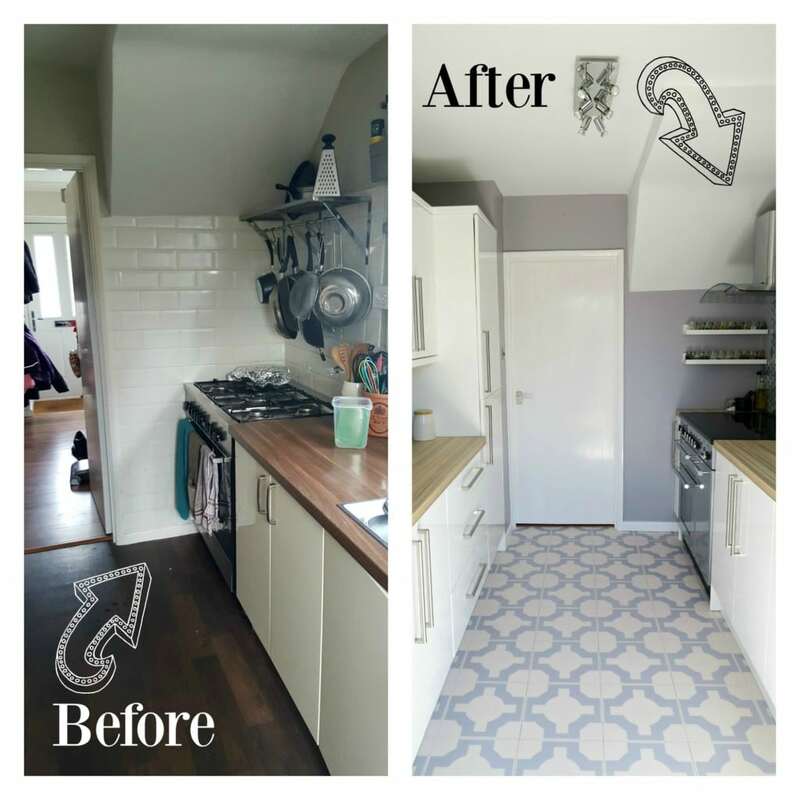 The tiles are refreshing to the eyes and it makes the kitchen look lighter and breezy. Great choice! 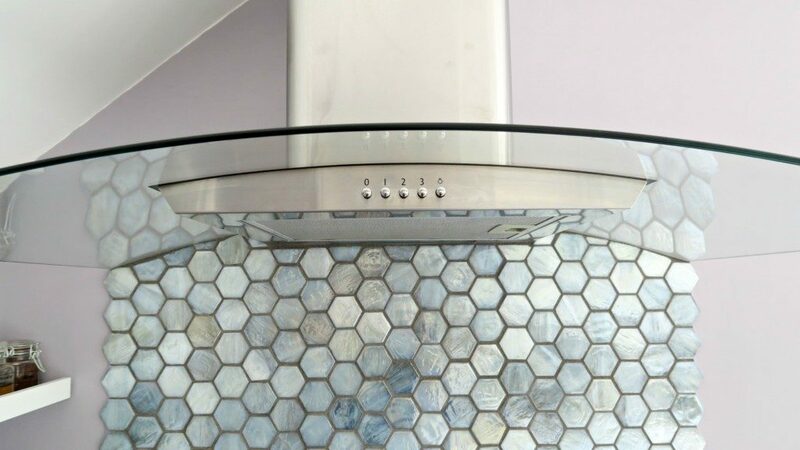 However, I have concerns with the bee hive wall decoration you installed on the wall along the RangeMaster stove. The cut and the colour doesn’t look quite fitting, what are the factors you considered in choosing that design? 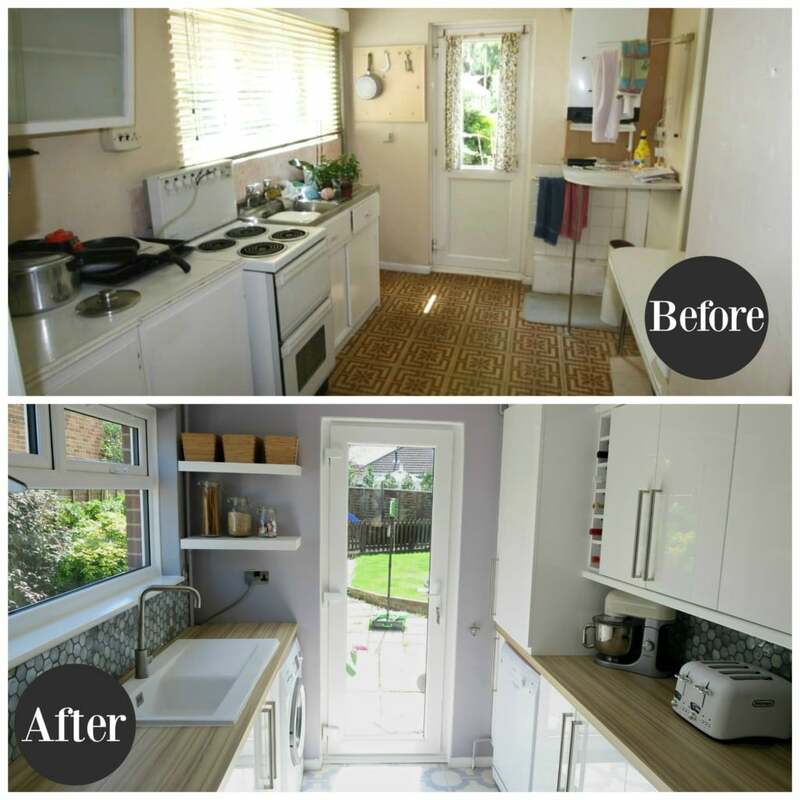 What an incredible kitchen transformation – thanks for sharing! The combination of patterns is so unique but creates such an interesting and modern feel. It’s amazing how much more spacious the kitchen looks. Utilising white in any room is an easy way to make a room feel larger and modern. The use of white in the kitchen cabinets has clearly made a dramatic impact on the rooms feel. For spaces like this in the house which are constantly used, it’s a great idea to consult or use a builder to take out the stress of the process and ensure that the job is effectively executed. Wow, you did a very good job with your kitchen. I’m deeply in love with those mosaic tiles. Oh wow, the difference is astounding! It looks like a different place. I absolutely love what you’ve done. 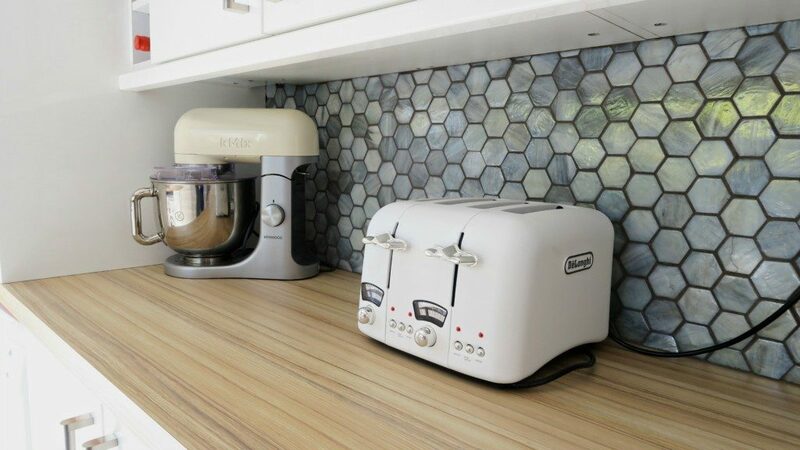 Your new kitchen looks bright, full of cupboard space, sleek yet homey. Love it! That floor is gorgeous! Thank you, we are super pleased with it. Oh have fun deciding and designing. It is so much fun getting a new kitchen and putting it all together. We are really pleased with it, and now I have worktop to prepare on! The worktop is laminate! £87 per 3mtr, but I really pleased with it. Thank you, we are really pleased too. 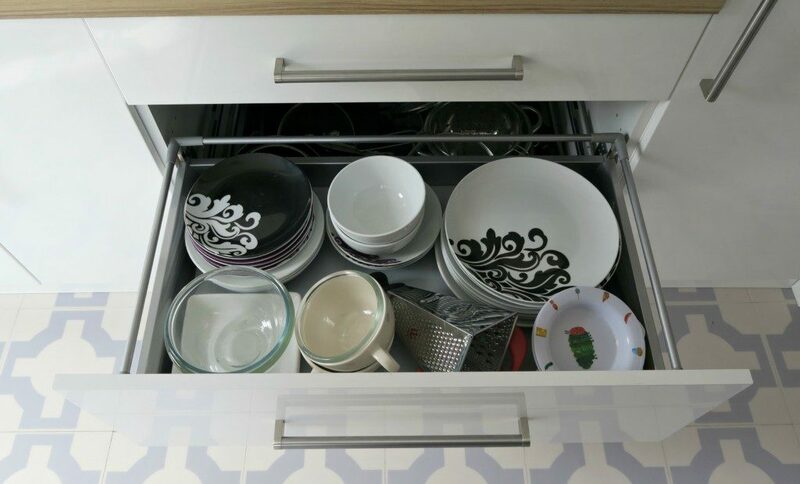 The drawers are such a great addition to the room, I can fill them up with sooo much! What a difference. Congrats on getting through this project, kitchens are hard work! 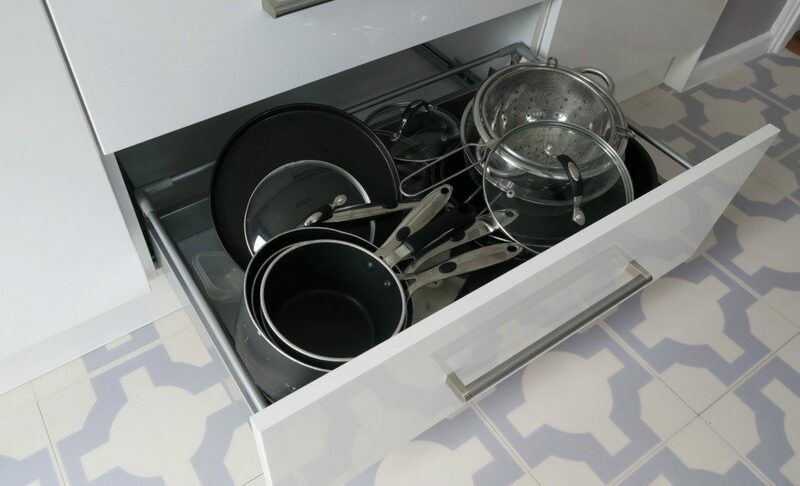 Enjoy your new space, and yes, pan drawers are the best!! What a beautiful room! And congrats on finishing it! I remember opening a bottle of bubbly once ours was complete – such a feeling of relief. the floor tiles are amazing! 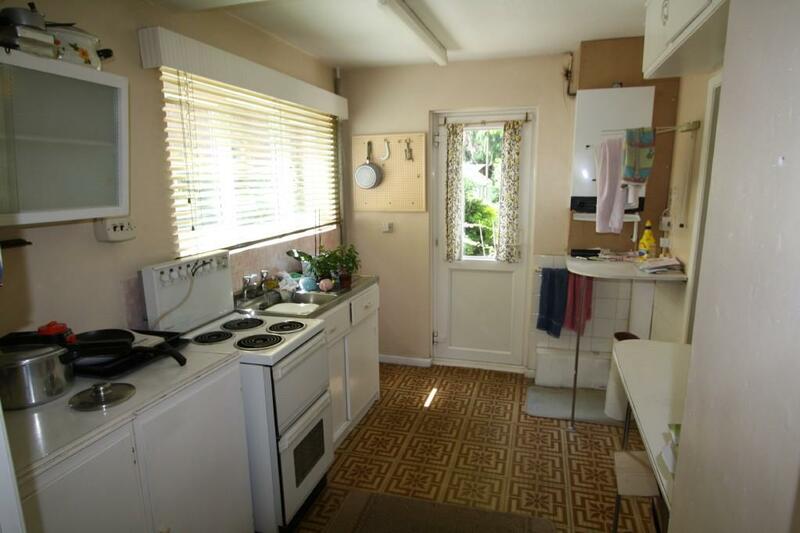 I am incredibly jealous of your kitchen space. It’s so stylish! You just be very proud to show it off. Wow such a transformation. It’s like a brand new house. I love your new kitchen. 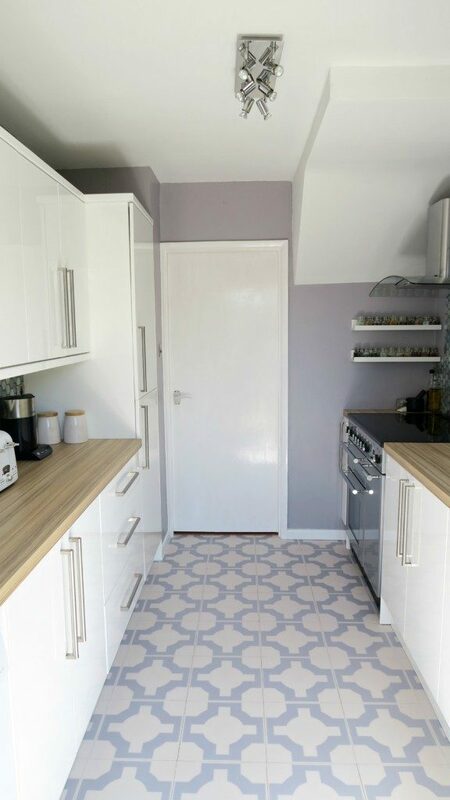 We are moving house in 2 months and I can’t wait to get the kitchen designed. Oh my word, this is so beautiful. wow, I love the colour scheme, it looks so different, so much better. 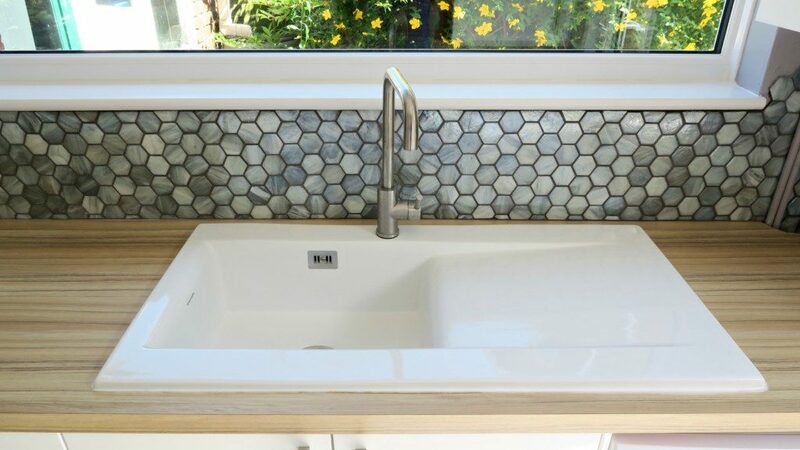 Those tiles are gorge!